An one day workshop on Basic DSLR & Press photography, organised by Trivandrum Photographers’ Forum (TPF), will be held here on April 29at MES Hall Trivandrum. 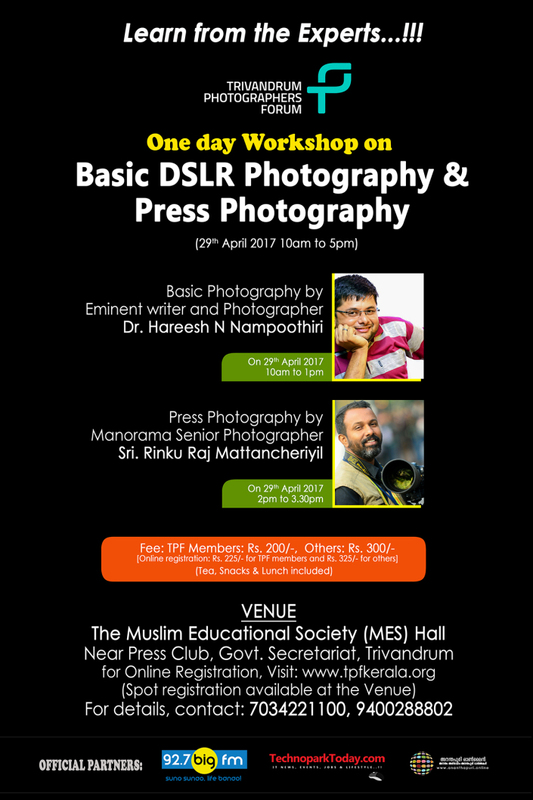 Eminent writer and photographer Dr. Hareesh N. Nampoothiri will handle the class on Basic Photography and Photo Journalist Rinku Raj Mattancheriyil will lead the Press Photography session. Fee for the workshop is Rs. 300 for non member and Rs. 200 for TPF members. Spot registration available at venue.